Services provided to people who are no longer able to take care of themselves due to chronic illness, injury, or the effects of aging. Care is typically provided in your home, a facility, or other community-based setting. Why is long term care a growing concern? People are living longer. That’s the good news. The bad news is that people are living longer. The fact is the longer you live the more likely you will need care. Families are geographically dispersed and women who traditionally took care of parents are now working outside the home. Government systems are already overburdened. This will only get worse once baby boomers begin to retire. The federal government has recognized this and they are offering LTC insurance to federal employees. We feel that by offering their own long term care program, it appears the government is sending a crystal clear message: Get long term care insurance coverage because we will not be making this an entitlement. The cost of care keeps going up. Currently, the average length of stay in a nursing home is 2.8 years4. What are the advantages to owning a Long Term Care insurance policy? Long Term Care insurance not only helps pay for the high cost of long term care; it also helps protect retirement savings, property, family assets, and lifestyle. Equally important, it can help provide comfort to your clients who will know they’re being taken care of the way they wish without having to impose on family members as full-time caretakers. People who want to protect their family from the consequences of long term care understand the need for LTCi. Preserve your freedom of choice. Choosing a policy that works for you and your family is typically a five-step process. Step 1. Choose a Daily Benefit: Ranging from $100 to $500 per day, this is the amount of benefit available to reimburse actual charges. This daily benefit is typically chosen based on the average cost of care in your area. Step 2. Select a Benefit Period: Typical benefit periods include 2,3,4,5, 6, 10 Year or a lifetime of benefits. This is how long the insurance carrier will pay for your care – you decide which benefit period makes sense for you. Step 3. Select Inflation Protection: This option determines how your benefits can increase to keep pace with inflation over time. The recommended inflation option* is determined by your age. Step 4. Choose an Elimination Period (Deductible): This is the number of days that you elect to pay for care before your policy begins to pay benefits. The standard elimination period is 90 days. Policy and carrier recommendations are made based on your age, health, cost of care in your area, marital status and financial situation. There is a lot to consider before purchasing a policy. It is important to talk with an insurance professional to discuss your options. 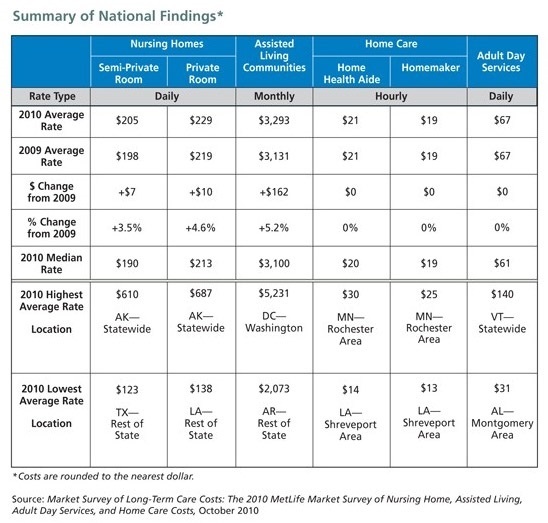 In 2002, the MetLife Mature Market Institute pioneered the collection of national market survey data on nursing home, assisted living and home care costs. Since then, these market survey data have been updated and released on an annual basis. The states were divided into three groups, according to their population – under 3 million, 3 million to 10 million, and over 10 million.